From the summit of Cloud Peak, left to right, Black Tooth Mountain, Mount Woolsey and Hallelujah Peak at far right. Hallelujah Peak (12,594 feet (3,839 m)), also known as Peak 12590, is located in the Bighorn Mountains in the U.S. state of Wyoming. 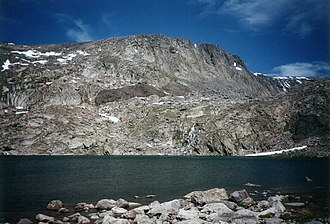 The peak is the fifth-highest in the range and it is in the Cloud Peak Wilderness of Bighorn National Forest. Hallelujah Peak is 0.64 miles (1.03 km) northeast of Black Tooth Mountain and connected to that peak by a knife-like ridge known as an arête. ^ a b c d "Peak 12590, Wyoming". Peakbagger.com. Retrieved October 5, 2014. ^ Willcox, W.B. "An American Tyrol, Climbs in the Bighorns 1933". American Alpine Club. Retrieved October 5, 2014. ^ Cloud Peak, WY (Map). TopoQwest (United States Geological Survey Maps). Retrieved October 5, 2014. ^ "Central Bighorn Mountains". Peakbagger.com. Retrieved October 5, 2014. Bighorn National Forest is located in northern Wyoming, United States and consists of over 1.1 million acres. Around 99% of the land is above 1,500 metres, the forest is named after the Bighorn River, which is partially fed by streams found in the forest. Streams in the range are fed primarily by snowmelt and snowmelt mixed with driving rainfall, within the forest is the Cloud Peak Wilderness area in which no motorized or mechanical equipment is allowed. The only access into the 189,000 acre wilderness is on foot or horseback, there are 1,500 miles of trails in the forest, along with 32 improved campgrounds and three scenic vehicular byways. U. S. Highway 14, known as the Bighorn Scenic Byway, the forest is primarily lodgepole pine, along with several species of spruce and aspen. While grizzly bears have not inhabited the forest since the early 20th century, other large mammals include cougars, mule deer and moose. Coyotes are present in this forest, numerous lakes are found within the forest and most are naturally stocked with trout and at least 100 other fish species. Wyoming /waɪˈoʊmɪŋ/ is a state in the mountain region of the western United States. The state is the tenth largest by area, the least populous, Wyoming is bordered on the north by Montana, on the east by South Dakota and Nebraska, on the south by Colorado, on the southwest by Utah, and on the west by Idaho. Cheyenne is the capital and the most populous city in Wyoming, the state population was estimated at 586,107 in 2015, which is less than the population of 31 of the largest U. S. cities. The Crow, Arapaho and Shoshone were some of the inhabitants of the region. Southwestern Wyoming was included in the Spanish Empire and Mexican territory until it was ceded to the United States in 1848 at the end of the Mexican–American War. The region acquired the name Wyoming when a bill was introduced to Congress in 1865 to provide a government for the territory of Wyoming. The territory was named after the Wyoming Valley in Pennsylvania, with the name ultimately being derived from the Munsee word xwé, wamənk, the mineral extraction industry—especially coal, natural gas, and trona—along with the travel and tourism sector are the main drivers behind Wyomings economy. Agriculture has historically been an important component of the economy with the main commodities being livestock, sugar beets, grain. 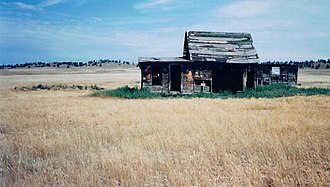 The climate is generally semi-arid and continental, being drier and windier in comparison to the rest of the United States, except for the 1964 election, Wyoming has been a politically conservative state since the 1950s, with the Republican party winning every presidential election. Wyoming is one of three states to have borders along only straight latitudinal and longitudinal lines, rather than being defined by natural landmarks. Wyoming is bordered on the north by Montana, on the east by South Dakota and Nebraska, on the south by Colorado, on the southwest by Utah, and on the west by Idaho. It is the tenth largest state in the United States in total area, from the north border to the south border it is 276 miles, and from the east to the west border is 365 miles at its south end and 342 miles at the north end. The Great Plains meet the Rocky Mountains in Wyoming, the state is a great plateau broken by many mountain ranges. The Gallatin Range is a mountain range of the Rocky Mountains, located in the U. S. states of Montana and Wyoming. 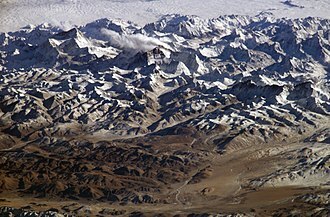 It includes more than 10 mountains over 10,000 feet, the highest peak in the range is Electric Peak at 10,969 feet. The Gallatin Range was named after Albert Gallatin, the longest-serving US Secretary of the Treasury, the range extends 75 miles north to south and averages 20 miles in width. The southernmost peaks of the range are in the section of Yellowstone National Park. The Yellowstone River flows north on the flank of the range. 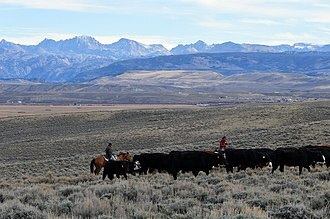 The Madison Range parallels the Gallatins to the west, the northern end of the range is near Livingston and Bozeman Pass separates the Gallatins from the Bridger Mountains to the north. The range is an part of the Greater Yellowstone Ecosystem and has grizzly bears, wolves. Within the Gallatin Range, the Gallatin Petrified Forest is one of the largest petrified forests of the Eocene Epoch, the petrified wood that comprise it consist of the mineralized fossils of a mixture of transported logs and in place wooden tree trunks rooted. The Absaroka Range (/əbˈsɔərkə/ or local /əbˈsɔərki/ is a sub-range of the Rocky Mountains in the United States. The range borders the Beartooth Mountains to the north and the Wind River Range to the south, the northern edge of the range rests along I-90 and Livingston, Montana. The highest peak in the range is Francs Peak, located in Wyoming at 13,153 ft, there are 46 other peaks over 12,000 ft. The range is drained by the Yellowstone River and various tributaries and it is only open during the summer. U. S Route 14/16/20 follows the Shoshone River from Cody through the range to the gate of the park. The range is named after the Absaroka Indians, the name is derived from the Hidatsa name for the Crow people, it means children of the large-beaked bird. John Colter, who may have been the first white person to visit the area, early explorers included Gustavus Cheyney Doane and Nathaniel P. Langford, who climbed the summit of Colter Peak in 1870. USS Absaroka was named after this mountain range, the section of the range in Wyoming consists of volcanic breccia, whereas there is a transition to granite and gneiss bedrock further north of the state line. The Bear Lodge Mountains are a small mountain range in Crook County, Wyoming. These mountains are protected in the Black Hills National Forest as part of its Bearlodge District, Devils Tower National Monument was the first U. S. National Monument and draws about 400,000 visitors per year to the area. 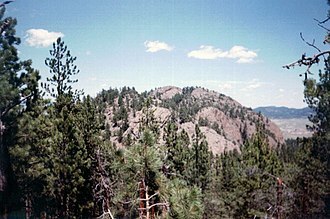 The Bear Lodge Mountains are one of three mountain ranges that comprise the Black Hills region and national forest, including the Black Hills itself, Wyoming is the closest major city and lies south of the Bear Lodge Mountains. Wyoming Highway 24 passes through the part of the range. The place names Bear Lodge, Sun Dance, and Rock Gatherer come from the history of Lakota people in this area, Devils Tower was declared a United States National Monument in 1906. 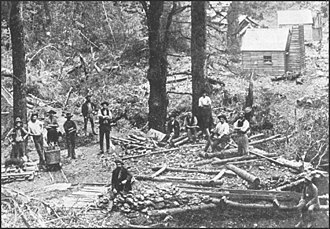 From 1907 to 1908, the area was the Bear Lodge National Forest, the Sundance National Forest through 1915, the Bear Lodge Mountains were formed as a byproduct of the geological processes that created the Black Hills, and offer hikes throughout bottomlands and buttes. Eagle Peak is a mountain in the Absaroka Range in the U. S. state of Wyoming and at 11,372 feet is the highest point in Yellowstone National Park. It is located about 6 miles east of the southeast arm of Yellowstone Lake, according to Lee Whittlesey, Eagle Peak was named in 1885 by geologist Arnold Hague for its resemblance to a spread eagle. Another source states that it was named in 1878 by Jack Newell, up until the 1930s, most park officials and geologists believed that Electric Peak near Gardiner, Montana was the parks highest peak, not Eagle Peak. It is ranked as the 218th highest peak in Wyoming and the 2252nd highest peak in the United States, during the historic Yellowstone fires of 1988, the south slopes of Eagle Peak were affected by the Mink Fire. Eagle Peak is part of the Absaroka Range and is formed of Eocene age volcaniclastic rocks, in the last ice age, the area was covered by an ice cap over 1,600 feet thick. Glacial deposits remain in some locations on the mountain, located in the Absaroka Range, on the park boundary with Shoshone National Forest in northwestern Wyoming, the mountain rises about 6 mi east of the southeast arm of Yellowstone Lake. The mountain is one of the highest points in the Washakie Wilderness area of Shoshone National Forest. Several creeks flow through the mountain and the area and they become a vehicle for cold melt water. The Gardner River flows to the east of the summit, some of the runoff is fed by the melting of the two major snowfields found in the shadows of the north face of the mountain. The range to the east drains into the Yellowstone River via the Bighorn River, Eagle Peak is one of the most prominent features of the Eagle Peak Quadrangle, a USGS division used for surveying purposes. Other nearby peaks are Mount Humphreys, Table Mountain, Mount Schurz, Pinnacle Mountain, Turret Mountain, the mountain is fairly inaccessible, being a 15-mile hike from any of the park roads. From outside the park, the peak can be ascended by hiking up the Fish Hawk Creek valley, which is around 25 kilometres one-way. It is climbed from inside the park, by sailing to the southeasternmost tip of Yellowstone Lake, hiking down the Yellowstone River valley, flora includes sedges and rushes, and tufted hairgrass in alpine meadows. Clouds Rest in Yosemite National Park is an arête. Crib Goch, Snowdonia, is an arête. Cloud Peak Wilderness, as viewed from Freezout, off Cold Springs Road. Black Tooth Mountain, as viewed from the summit of Cloud Peak. Mount Woolsey is to the immediate right of Black Tooth Mountain.